New York Gov. Andrew Cuomo is soon expected to introduce legislation that aims to more fully guarantee access to abortion in his state, fulfilling a promise he made in his January 2013 State of the State address to “protect a woman’s freedom of choice.” For more on attitudes toward abortion, see Public Opinion on Abortion slideshow. In the speech, the governor vowed to pass a Reproductive Health Act, which media reports indicate could make it easier for women to obtain late-term abortions under state law. Under current New York law, which dates from 1970, a woman who has been pregnant for 24 weeks or more can obtain an abortion only if her life is in danger. Washington state also has discussed making abortion more accessible. A bill that would require most insurers to cover abortions passed the state House earlier this year, but its prospects in the Senate are uncertain. Washington remains the only state to legalize abortion through a popular vote, having done so in 1970, and it would be the first state with an insurance mandate for abortion coverage. The two measures run counter to a recent, nationwide trend toward imposing more restrictions on abortion. For example, 10 states – Alabama, Arizona, Florida, Kansas, Louisiana, Mississippi, North Carolina, Oklahoma, Texas and Virginia – have enacted laws in recent years that require physicians to perform an ultrasound prior to the termination of a pregnancy. And more than 20 states have banned or severely limited insurance coverage of abortion procedures. In addition, a number of states have passed laws in recent years that, with very narrow exceptions, outlaw abortion beginning at 20 weeks into a pregnancy. Arkansas has gone even further, putting the cutoff at 12 weeks. The Republican-controlled legislature overrode Democratic Gov. Mike Beebe’s veto to pass that law on March 6. In late March, North Dakota enacted a clutch of new abortion restrictions. The first, passed by legislators on March 22, puts before the state’s voters a constitutional amendment that would define life as beginning at conception. The measure will be on the ballot in November 2014 and would, if approved, likely outlaw most or all abortions in the state. On March 26, North Dakota Gov. Jack Dalrymple signed into law three additional abortion restrictions that are scheduled to go into effect Aug. 1. The new North Dakota laws ban the procedure if a fetal heartbeat is detected – which can occur as early as six weeks into a pregnancy – and in cases of the fetus having genetic defects, such as Down syndrome. They also include language requiring abortion providers to have admitting privileges at a local hospital, a provision abortion-rights groups say is aimed at making it harder for doctors to perform abortions in the state. 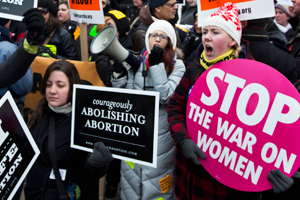 Many of the more restrictive laws have been challenged in federal court, and one or more of the cases could end up before the U.S. Supreme Court, as discussed in a recent Pew Research Center report on the history of key abortion rulings. In many states, access to abortion also is limited by a scarcity of clinics offering to perform the procedure. In some states, particularly in the more socially conservative South and Midwest, women must travel hundreds of miles to secure an abortion. But in New York and other more socially liberal states, most women have easier access to abortion services, as discussed in a February Time magazine article. Because of federal court rulings, women in New York already can obtain late-term abortions if their health is in danger. However, as The New York Times reported, an official in the Cuomo administration contends that the proposal is necessary in case the Supreme Court one day overturns earlier abortion-rights rulings, particularly Roe v. Wade, its landmark 1973 decision establishing a constitutional right to abortion in most cases. But women’s rights groups and abortion-rights supporters have applauded both ideas, arguing that Cuomo’s proposal sends a strong message in support of reproductive rights while the Washington measure would provide certainty in the midst of the Affordable Care Act’s implementation. The federal health care law has raised questions and sparked debate about abortion coverage, specifically in the new state exchanges. Recent Pew Research Center polling addresses the public’s views on a few abortion-related questions. A January survey shows, for example, that most Americans (63%) do not want the Supreme Court to strike down Roe v. Wade. Only about three-in-ten (29%) think the high court should completely overturn the ruling. But at the same time, nearly half (47%) of American adults say it is morally wrong to have an abortion, according to the same Pew Research poll. Just 13% of adults view abortion as morally acceptable; 27% say abortion is not a moral issue, and 9% volunteer that the morality of abortion depends on the situation.